Leaving Ialyssos behind and continuing due southwest, one reaches Kamiros, one of the three cities of ancient Rhodes, which merged into the new city of Rhodes towards the end of the 5th century. The legend of Althaemenes and his father Katreas points to relations between Rhodes- Kamiros in particular - and Crete, as well as between Rhodes and other nearby islands. A land of many mountains but also of fertile plants, Kamiris, the larger area of Kamiros, is seperated from the rest of the island by Mt. Atavyros and looks on Crete and the Peloponnese. Archaeological findings in the region, prehistoric cemeteries and important classical monumnets, show how important a city Kamiros was. The acropolis of Kamiros was a hill whose every side but one was a sheer drop to the plain below. The one other side sloped gently down to St. Minas Cape and this was the residential area of Kamiros, while the public buildings and sanctuaries stood on the plateau crowning the hill. The most important of these was the shrine of Athena Kamiras, of which quite a few remains have been preserved, and a more than 200m long Doric stoa with a double colonnade and a series of rooms at the back. Built towards the end of the 3rd century B.C. 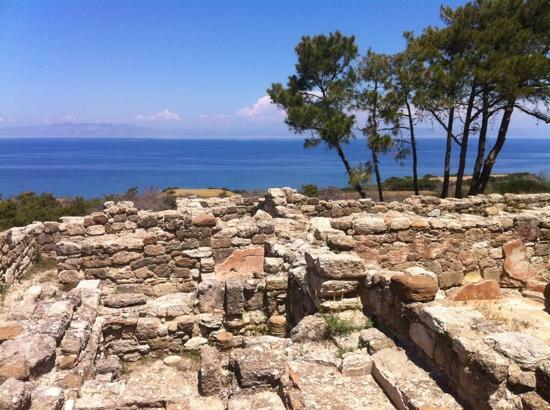 or in the beginning of the 2nd, this stoa replaced a large water reservoir dating to the 6th or 5th century B.C. 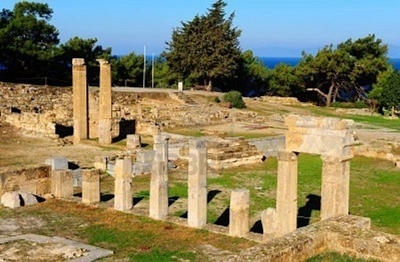 In the area occupied by the private houses of Kamiros, a shrine including a Doric temple of the 3rd century, a number of altars, dedicated to various deities, several inscriptions and a doric fountain of the early 3rd century B.C. were discovered.